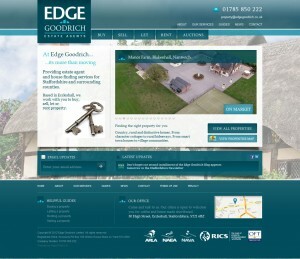 This week has seen the launch of a new website for our client Edge Goodrich, a local estate agent. Edge Goodrich had worked with a developer to produce an initial launch site that used WordPress and the WordPress Property plugin. building upon the strong foundation that had been built by the previous developer, we have rebranded the website with a new design and revised layout to make the site simple and easy for users to browse. WordPress has been an ideal platform for this website as it not only allows for full content changes by the client, but we have also further developed the existing integrations with WordPress Property and the property management software used by the client, Expert Agent. To help inform and engage customers, integration with Twitter, Google Maps V3 API and Mail Chimp email newsletter management.